Belly dancing and live music! Souk is a Moroccan Bistro that offers Dallas a romantic dining experience along with an exotic atmosphere. Moroccan cuisine is extremely refined, thanks to Morocco's interactions and exchanges with other cultures and nations over the centuries. Moroccan cuisine has been subject to Berber, Moorish, and Arab influences. The cooks in the royal kitchens of Fes, Meknes, Marrakesh, Rabat and Tetouan refined it over the centuries and created the basis for what is known as Moroccan cuisine today. Souk is adding culture to the Dallas metroplex with its unique cuisine, music, and bazaar. Amazing restaurant! Food is great we love this place and highly recommend. Service was great from the time we entered until the time we left!! Our drinks never were empty and food was delicious!!! Most definitely recommend.. I didn’t like the seating, too close to another couple who’s conversation I could here ( Did not want too) . Would have preferred a more private area or not so close to others. I have eaten at Souk on three previous occasions - lunch and dinner. I've always enjoyed it -and loved the funky decor. It is being redecorated/remodeled, I understand, and not quite finished. The atmosphere was very austere. The menu has changed somewhat and is not as interesting or as good. I really was disappointed. I don't think I'll give up on it. Perhaps they are just trying some new things. The Belly Dancing was a bit odd, and it went on for literally our entire meal. It was really odd, she was getting money put in her waistband by older men in the restaurant and it made us feel very uncomfortable. We have always had excellent service at Souk until this evening. We had reservations for ten, and we had instructed the manager that we were celebrating two family birthdays. One would think they would think that he would have had one of his best waiters take care of us. Not the case. He was unfriendly and we had to tell him that we hadn’t had our drink orders taken. He wanted to know what we were ordering as soon as we sat down. We had to ask for enough menus and ask for the wine list twice. He then misordered two of our entrees. He did not come back to see if everything was as ordered or ok. Waiters and managers do that in much less expensive places to eat. I really need a good reason to return to what had been one of our favorite places at TG. Enjoyed the food and overall atmosphere. Lamb shawarma very good! Completely outstanding service and food! Jim Enen did an outstanding job, as well as all the staff. 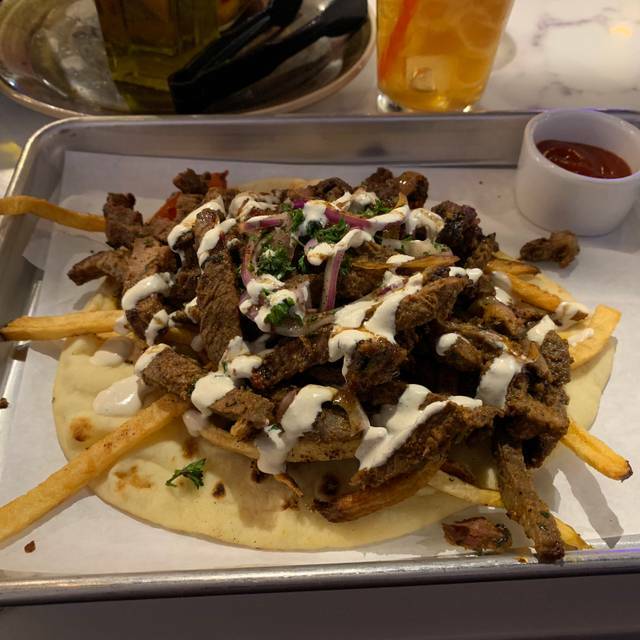 I've eaten at Souk several times and it never disappoints. They have a good variety of Morrocan and other middle eastern foods and flavors. It was a pleasant surprise to see a belly dancer on our last visit. Perhaps because we dined on NYE. Maybe it was a special thing for this special evening. Either way I will return again for delicious food! My wife and I thoroughly enjoyed ourselves. This was our second visit. The food was delicious. We enjoyed our cocktails. Live music outside was great. Then suddenly the music ends I got really loud. We asked our server what the deal was and he explained the music was up loud for the belly dancer. We didn't realize they were having a belly dancer on that night. We were extremely pleased. My wife got up and danced with the belly dancer. What a load of fun. We will definitely go back and have recommended it to a number of our friends. The mezze platter was excellent, the star being the harissa sauce. Chicken shawarma was flavorful and the kofta lamb was moist a ND quite delicious! The hummus is phenomenal. Kebabs and lamb shawarma is to die for! Love Souk! Excellent food and service. Belly dancer Saturday night. Only drawback is the lighting. Could be a bit softer and more intimate. Everything was great for the most part. The food was excellent, the server was very attentive, the music was awesome and diverse, & the drinks were superb. You couldn’t even taste the alcohol but definitely feel it afterwards, that’s what you call a great bartender. Where they fell short is with the hookah. It was very harsh and I’m not sure if he even tested it himself. It’s like the nicotine level was super high for some reason. BUT, I would definitely recommend this place to anyone who would like to have a great time and foodies. Prices are on the high end but with the food portion it makes it well worth it especially because the food is delicious. The parking was a bit of a challenge, but it might have been just because of the event next door. The harissa chicken, lamb shawarma, and classic hummus were all excellent. Great service. We plan to return soon. Very good food, in a vibrant atmosphere. Hookah bar outside may get a little noisy for some, but for those who want that experience, it is fun. Would have liked a couple more vegetarian options in the entrée section (had only two options, both somewhat similar). But the side of falafel gets you past the limited vegetarian options. The service was excellent. The waiter continuously monitored our needs and made recommendations that were not meant to sell more food but to cater to our needs. More than once, someone from the managerial staff came by to check to see if we were content. A happy place to be at. Service was horrible for an empty restaurant with only our table of 6. I constantly had to search for our server to try to make eye contact to bring him to our table. After serving us, he did not come back to check on our food, he had to be told to remove mezza dishes from table, and I continued to signal to him to place new drunk orders. Embarrassed as I was the hostess. My harissa chicken was good but the chicken schwarma my friends were badly disappointed with and no better than cafeteria style. Our server would not have known as he never asked how are food came out. Was there for Cousin's night. Food was great all around, as we each ordered something different. Salmon was fabulous. So good - stumbled upon their 5 year anniversary party on date night and we couldn’t have been happier! Amazing food, and the violin guy was playing live, incredible to watch. We will be returning as often as possible! The menu changed since I was there last but still very good and the lamb tangine is still on menu but has changed slightly but still very good. Love the Happy Hour half price wine bottles. Really good and inventive food, loved the fun cocktails, but it took two+ hours for a single round of drinks and two rounds of appetizers. Waiter was pleasant but seemed to have a hard time understanding us and/or using his electronic order pad. Drink spilled on the feet of one of the party by the server, and clean up was casual with no follow up from manager or waiter to bring her another napkin or check that the one they brought was enough to dry her off. Forgot to bring bread that had been ordered, forgot to bring to-go box. The long delays in order-to-food would have been more understandable but this was a very uncrowded Monday night. Very delicious food! The hummuses were amazing! So if your looking for a great evening and great mediteranean and morrocan fare, with music and the occasional belly dancer on friday and saturday nights. This is the place! Absolutely had a fantasticly, chill, romantic dinner with my girlfriend there last night. Outside on the patio a violin player bowed and enchanted with modern tunes. It really made for a very incredible night. The staff was very accomidating and made sure our night was a pleasure. This is a great date place guys!! Just a heads up if your looking for a date spot or a place to take that special someone . Souk is a definite must, with music , ambiance, great food and the lively buzz of Trinity Grove. The management of this establishment seems utterly clueless. We sat down for dinner at 8:30. We ordered drinks, appetizers, and dinner shortly thereafter. We received drinks and appetizers quickly, but then ALL STAFF disappeared for nearly an hour, at which point the server came to tell us that our order had been lost. Hannah, the manager, came out to offer us free dessert for our inconvenience. Absolutely, utterly the wrong way to handle ignoring a table full of customers for over 45 minutes. They promised us that our meal would arrive in 10 minutes, which it did not. It’s extremely disappointing, because the food was excellent, but every step from the great cooks to the customer is marred by absolute incompetence. 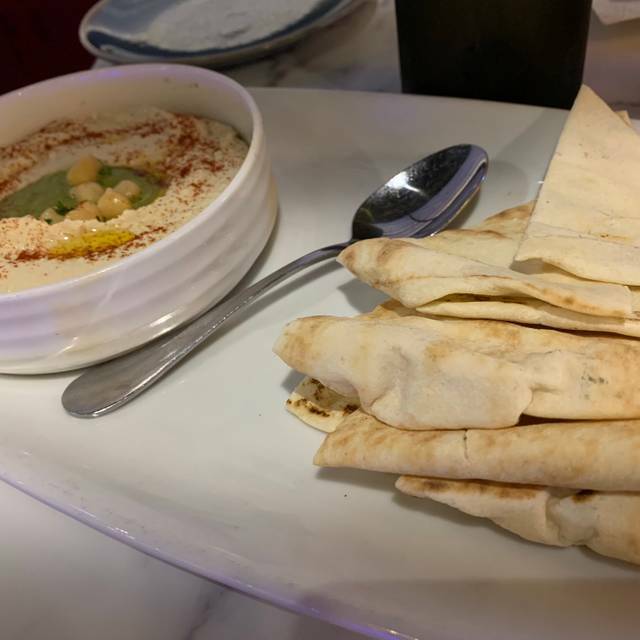 If you want excellent Mediterranean food with attentive service, go to Medina instead. Food was mixed. Some good, some meh. The frozen ginger bourbon drink was great, and I’m usually not a fan of frozen drinks. Server was very good until he forgot about us for awhile. Nice atmosphere inside. Outside had live music on Friday; was very loud. Not sure if it is under new management, but it seems they have changed the way they present their dishes since I had last been there. The chicken schwerma was very dry and bland. I have always enjoyed it in the past when it was not served on fries and a piece of flat bread. Also, the lights weren't turned down as much and took away from the ambience. Probably won't go back. Too bad, because we really enjoyed it in the past. The service was excellent. Our waiter explained the foods which Mediterranian and tastes new to us. The lamb kabobs were good and the veggies grilled just right. We will go again and invite friends. It is different cuisine, extremely well done. The restaurant itself was beautiful and clean. However, the food was just satisfactory. We were charged for an entree that we didn’t order and unfortunately discovered this the next day. Our server was very slow and not present enough. This place has potential, but seemed understaffed. service was professional and friendly. comfortable, clean space with nice design touches. patio will be nice when weather gets cooler. food was delicious with tasty, unique drink options. will return. We drove down from Frisco and met our sons for dinner. We had dined once previously and had a great experience and were expecting a repeat. Unfortunately, we were very disappointed. We ordered family style as we had in the past. Our food came, we quickly ate, and left as soon as we were able. First, the restaurant was warm. Heat and humidity from outside was pouring in through propped open doors. Second, the drinks were poorly made. And, thirdly, the family dinner was not much more than large pile of over cooked and dried out meats on top of a pile of rice. We ate because we needed nourishment, paid the bill and left leaving partially drank drinks and plenty of what would have been a solid meal or two of leftovers. Weren’t worth taking home. Our last visit was only about 5 mos ago. Not certain what has changed but a drop in quality and attention to detail is evident.